Delta is the fourth letter of the Greek alphabet. It also means the fourth of any series of classification. In socio-politics, Journalism (or media) is the Fourth Estate, because of its influence on the three other estates; Politics, Religion, and the Mercantile. Notably, the first Masonic magazine in the Philippines, published in 1906, featured Masonic potpourri done in journalistic panorama. The magazine was given the name DELTA. Like the Greek capital D, DELTA significantly denotes things triangular. The Delta Sagrada or Sacred Triangle was the commonly accepted Masonic symbol during the days of the Katipunan. The Triangulo, more than the Square and Compasses, pervaded the Masonic scene back then as a preferred icon of membership and eventually was incorporated in the present Philippine Flag. Among other Masonic references, DELTA principally allude to Deity, the Great Architect of the Universe; and His attributes exemplified by the Masonic Trinity - Wisdom, Strength and Beauty. DELTA also appertains to any triangular tract of alluvial land between diverging branches of the isthmus of a river. The banks of Sta. Elena breaking with the edge of Jesus dela Pena typifies a river delta. Aside from its prolific shoe-making industry. Marikina City is renowned for it being a valley nurtured by its river. Rivers sustained life, fostered trade and commerce and from its mere bournes great cultures emerged. Cradles of civilizations were situated adjacent to mighty rivers: the Tigris-Euphrates to the Sumerians, the Nile to the Egyptians, the Yangtze to the Chinese and the Ganges to the Indians. 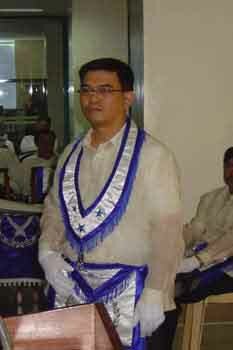 The brethren of Marikina Lodge No. 119 found it apt, graphic and sentimental to christen their official newsletter - RIVER DELTA.